This article is about R.O.B. 's playable appearance in Super Smash Bros. Brawl. For his non-playable appearance in Adventure Mode: The Subspace Emissary, see Ancient Minister. For other uses, see R.O.B..
R.O.B. (ロボット, Robot) is a newcomer in Super Smash Bros. Brawl. His full name is Robotic Operating Buddy and he is based on the R.O.B./Robot NES/Famicom peripheral. He was unveiled in a mass leak prior to the Japanese release of Brawl. R.O.B. was confirmed on the DOJO!! March 6, 2008. R.O.B. currently ranks 18th on the tier list at the bottom of the high-mid tier. R.O.B. possesses a strong camping game with two very effective projectiles; one is a fast transcendent projectile that can travel across entire stages while going through any hurtbox it connects with, and a powerful item-based projectile that produces a lingering hitbox when it lands, while being able to be picked up and glide tossed with. He also has one of the best recoveries in Brawl, that gains incredible distance while giving R.O.B. nearly free reign to act out of. R.O.B. additionally possesses great tilts and effective aerials, with them having great reach or large hitboxes. However, R.O.B. has significant problems KOing opponents, at least without racking up well in excess of 150+% damage; his finishers aren't powerful (with most having low knockback scaling, making it especially difficult for R.O.B. to KO heavier characters), while having slow start-up, poor hitbox placement, or both, that makes them difficult to land. Additionally, R.O.B. has a large hurtbox, which when combined with his heavy weight and slow aerial mobility, leaves him vulnerable to juggling. R.O.B. 's hurtbox also accentuates his problems dealing with projectile camping from characters like Falco, especially since he lacks a reliable reflector. The hurtbox combines with his below-average mobility to create difficulty in initiating approaches when he lacks a Gyro to glide toss. Another problem R.O.B. has is his poor momentum cancelling options, giving him among the worst endurance for a character of his weight class. Overall, R.O.B. has average matchups, where he holds an advantage over nearly every character below borderline tier, but loses the majority of matchups with several counters against characters above (including a notoriously poor matchup against Meta Knight). R.O.B. has achieved above average tournament results regardless, especially in Meta Knight-banned tournaments. Have R.O.B. join the player's party in the Subspace Emissary (The Subspace Bomb Factory (Part II)). With the exception of the third method, R.O.B. must then be defeated on Mario Bros.
R.O.B. plays the role of a long-range attacker very well, with projectiles and means to keep opponents at bay. His base up close is a blind spot, making it important to keep foes away. Many of his attacks balance moderate power and range with short lag-time. His moves with actual KO potential, though, have considerable start up lag or keep him airborne longer than desired. R.O.B. is also prone to Stale move negation on his KO moves (notably his down smash which, due to its low knockback scaling, can have trouble KO'ing heavier characters even at around 200%) rendering him unable to KO at times (however, his up throw can KO reliably at above 160%). He can easily set up an edgeguard using a forward or back throw, but his most powerful aerials are difficult to land. Despite his moves boasting only moderate knockback, R.O.B. can generally keep knocking his opponent away with superior range and combine any of his moves together fairly easily. The resulting damage adds up rather quickly with an experienced player. R.O.B. is decently heavy and floaty (making R.O.B, Samus and Yoshi the only floaty heavyweights), but he is also a large target. He has two projectiles, both with decent knockback and unique properties, which usually mess up the opponent's approach. The major flaw with these projectiles is that they are not spammable (as they must be charged/recharged). His aerial game is also good, with his forward aerial being fast and having moderate knockback, his neutral and back aerial being powerful but difficult to land, and his down air acting as a Meteor Smash (although it has a very slow start-up). His back aerial can also aid his exceptional recovery, both his back and down aerials push R.O.B. up slightly when using Robo Burner. With the addition of Robo Burner, he is quite interesting to experiment with on certain combination of attacks and techniques such as a Wall of Pain. In fact, a technique sometimes called "burner flashing," which is initiated by first using Robo Burner and then repeatedly pressing B, has been proven to be the farthest vertical traveling recovery move in one go. R.O.B. 's recovery does have its problems. He can't air dodge out of Robo Burner, making his recovery predictable for some characters and he can be juggled because he is floaty in both jumping and recovery, notably by Meta Knight and Fox. His slow fast falling also makes his momentum canceling poor, getting KOed vertically at relatively low percentages, especially for his weight class. R.O.B. 's side special reflects projectiles, but characters with more spammable projectiles can easily overwhelm R.O.B. from afar, and it isn't useful as an attack. Overall, with a very flexible ranged game, R.O.B. can be a dangerous foe for many characters in the game. 3% R.O.B. does a quick swing with each arm. 8% (arm tip), 6% (arm), 5% (body) Leans forward and punches with an impressive range. Can be aimed up or down. 3% (early), 5% (arms tip), 6% (arms base) R.O.B. throws both arms upwards. Can hit twice, with the first hit having set knockback and second hit launching opponents upwards. 5% (arms), 4% (arms tip) Quickly pushes his arms forward along the ground. Quick, produces opportunity for multiple hits. Can cause tripping. 6% (arms), 5% (arms tip) R.O.B. thrusts both his arms forward. S3 14% (base), 13% (mid), 12% (tip) Shoots a short beam from his eyes. Can be directed up and down like a shorter Robo Beam. May be considered a projectile, due to the fact that it can't break a Metal Box. Does average knockback. This move was officially named "S3" in Super Smash Bros. 4. 12% (base), 13% (mid), 14% (tip) R.O.B. plants his hands on the ground and does a handstand, shooting boosters out of his base upwards. Very high knockback (R.O.B. 's strongest move in terms of knockback) but is slow and predictable. High vertical range but has no horizontal range, making the move difficult to use, especially on stages without platforms. When sweetspotted and fully charged, it KOs at 70%. 2% (hits 1-4), 5% (hit 5) Lowers torso on his spine and extends arms, spinning them. Low damage and knockback, but decent range and multiple hits. It is the fastest down smash, tied with Zelda's. 10% Pauses for a second, then fires his boosters as he spins vertically. 10% (clean), 6% (late) Extends his arms forward. Has low lag, and is good for starting up aerial combos and edgeguarding. At low percentages, it can set up for a neutral or down aerials on heavyweights. 11% Aims his base behind him and fires his boosters. Pushes R.O.B. forward a little bit, although while he keeps the knockback after getting hit, it does nothing to increase or reduce momentum. The hitbox affects targets both in front of and behind R.O.B. each with decent knockback. This can be used for recovery in between Robo Burners, creating virtually the longest horizontal recovery move in the game along with Pound and Glide. 4-5% (hits 1-4), 3% (hit 5) Raises arms repeatedly above his head, hitting multiple times with good damage if used right. About 20% damage if all hits connect. 12% (base), 13% (booster base), 11% (booster mid), 6% (booster tip) R.O.B. fires a blast downwards. Boosts R.O.B. up a little bit, shooting his boosters down where he was. It's powerful, yet slow and can meteor smash. Keeps him stationary in the air shortly, although he can fast fall with it as long as he's in knockback after getting hit. When tiny, R.O.B. can use this move instead of Robo Burner to recover. Provides him an unlimited recovery move, because it pushes him upward and can be used infinitely to fly up the upper blast line infinitely without getting Star KO'd, making it also the only unlimited non-bomb recovery and the only infinite recovery (when tiny) of every Smash Bros. installment. Can also perform every Hyrule Jump (only when tiny). It should be noted that the uppermost hitboxes have weaker vertical knockback. 2% Squeezes opponent with his hands. Very fast and no ending lag. 10% Tosses opponent forward. Very fast. 10% Quickly swings his opponent backward. Can KO around 165%, if used very close to the ledge. 10% Grabs opponent, flies them into the air a short distance, turns them upside down, then crashes them into the ground (Similar to Olimar, Kirby or Meta Knight's up throw). 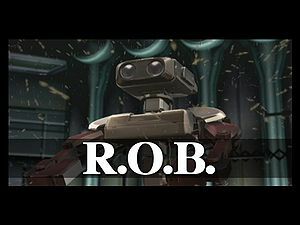 This is R.O.B. 's strongest throw along with his back throw, knockback wise. Can KO around 165%. 6% Gets up and spins with his right arms extended, hitting both sides of himself. 6% Quickly gets up and hammers both arms extended in each direction. 5% R.O.B. lowers his torso, withdraws his left arm and extends his right arm to sweep the floor around. Around 5%. 7% R.O.B. leaps onto the edge and swings both arms over-head. 10% Slowly climbs onto the stage and lunges his left arm forward. Robo Beam 5% (uncharged), 7% (charged), 9% (Super Robo Beam) Fires a long-range laser from his eyes that will pierce through opponents. The laser can be directed, and if the laser makes contact with a floor, ceiling, or wall, it will bounce off at an angle. Attempting to use the Robo Beam again immediately after using it will result instead in R.O.B. using a weak attack that only affects the area directly in front of him. After not using the Robo Beam for a minimum of 20 seconds, the attack will be powered up and become a Super Robo Beam. This Super Robo Beam has enhanced power and knockback when compared to the regular Robo Beam, and is visually wider. Arm Rotor 1-2% (loop), 3-4% (last hit) Spins his arms like a rotor. The move has a light push and also lifts him into the air by a small amount, and can also be directed up and down, causing the rotor's hitbox to move along with it. The move hits multiple times and finishes off with a weak attack that has decent knockback.It also works as a reflector that sends any projectile back towards the user at x1.5 the power. However, as the hitbox of the attack changes depending on the position of the rotor, in addition to the start-up lag of the move, the usefulness of this move as a reflector varies. Robo Burner 0% Activates burners on his base to fly into the air. During Robo Burner, R.O.B. will ascend vertically so long as the special move or up directional buttons are pressed. While in this state, R.O.B. can also attack to cancel out of the move. The Robo Burner is an extremely powerful vertical recovery, being one of the best vertical recoveries in Brawl, and a good horizontal recovery as well. The Robo Burner lasts a fairly long time, and when deactivated, it will not send R.O.B. into a helpless state like most recovery moves. However, when out of fuel, R.O.B. must return to solid ground in order to recharge the burner, or the move cannot be used again. It takes roughly 1.5 seconds to recharge. Gyro 7-18% (shoot), 2-5% (idle), 8% (thrown), 9% (smash & dash thrown), 3-7% (dropped) Produces a Gyro that he begins to spin. The Gyro can be fired off by using the move again while charging or when fully charged. The Gyro can be picked up after hitting foes or landing on the ground, and can continue to damage foes in this state, as it will deal slight damage to foes who contact it while the Gyro is spinning. When a Gyro on the ground stops spinning, it will disappear. As an item, foes can pick it back up to throw back at R.O.B., or he can pick it up to throw again himself, but the Gyro cannot be charged again if picked up. The Gyro can be glide tossed, and is generally considered one of the more powerful glide tosses in Brawl, due to its high range and knockback. Diffusion Beam 2% (close range) 4% (long range) 15% (hard hit laser) Begins firing a spiral-shaped beam from his eyes. The Diffusion Beam is unique in that it operates like the Superspicy Curry, as his entire moveset, excluding the Robo Beam, is usable during this Final Smash, in addition to items. Foes caught in the beam will take damage, but the beam itself has no knockback. However, there is also a powerful laser that appears instead of the spiral-shaped beam at points, which has strong knockback, and will usually KOs opponents hit by it. As the move's hitbox is directly related to the space in front of R.O.B. 's eyes, the beam can be directed at foes through the use of unorthodox methods, such as taunts. R.O.B. himself also gains invincibility while the Diffusion Beam is active. Assembles piece by piece as his parts drop from the sky. Up taunt: Faces the camera and spins his arms and head in a circle. Side taunt: Faces the camera and moves his head around, firing a small laser from his eyes. Down taunt: Faces the camera, moves his arms down and then moves them back up again, spinning them whilst he does so. Looks toward his right side, and then looks towards his left side. Slowly tilts his head downwards and then lifts it back up. Makes a pair of whirring noises. A cover of the track that would play when starting up Memory mode in Stack-Up, the first game that the R.O.B. accessory was compatible with. Spins his arms and moves them in a strongman pose while turning his head. Spins around up a slight inch in the air, then lands, then puts his arms down and brings them back up again while turning his head. Shoots sparks from his eyes, then flexes his upper body, like his side taunt. Chibo - Best Tri-State R.O.B. t0mmy - Best Northwestern R.O.B. R.O.B. was initially a top tier character, being ranked 6th in the first tier list (September 2008). He was considered a difficult matchup for many players, who weren't experienced enough at the time to get around his weaknesses, and he was very dominant, with his attacks known for being fast and having great hitboxes. However, as time progressed, R.O.B. 's weaknesses became more prominent, with players learning to get around the blind spots of his attacks, as well as the increasing dominance of Meta Knight, the character which countered R.O.B. the most. R.O.B. continued to drop down the tier list, with the biggest drop being him falling five places from the third tier list to the fourth. He currently ranks 18th place in upper-mid tier, in the eighth tier list, as of April 2013. The race of R.O.B.s appear under four roles in Super Smash Bros. Brawl. During the Subspace Emissary, they are a unit of the Subspace Army and are used to activate the Subspace Bombs, as well as guard the Ancient Minister and come in different variations; R.O.B. Sentry, R.O.B. Launcher and the R.O.B. Blaster. The bodyguards for the Ancient Minister are called "The R.O.B. Squad". When a pair of R.O.B.s are used to activate a Subspace Bomb, they are destroyed in the explosions. In the Subspace Emissary, it is revealed that the Ancient Minister is actually R.O.B. and the whole reason he was destroying the Super Smash Bros. World was because Tabuu had destroyed a lot of R.O.B.s, which upset the Ancient Minister. Tabuu then threatened to extinguish the rest of the R.O.B. race if the Ancient Minister would not aid him in his plan. It is also revealed that R.O.B., the Ancient Minister, was once the ruler of the world and he lives on a floating island along with the other ministers. Samus, Pikachu, Captain Olimar, Captain Falcon, Donkey Kong and Diddy Kong were able to get on this same island. However, when they arrive, the Ancient Minister refuses to battle with them. A hologram of Ganondorf appears and commands the R.O.B. minions to detonate all the Subspace Bombs in the building, only to have the Ancient Minister tell him off. Ganondorf then orders the R.O.B.s to attack the disobedient Minister. They burn the Minister's robes away to discover that their target is a R.O.B. himself. At that point, R.O.B. decided to stop destroying the world and joined the heroes. After he and his friends defeat a flock of Auroros sent in by Ganondorf, he mourned at the fact that the Subspace Bombs are about to selfdestruct, along with the R.O.B.s that set them off. Realizing that they cannot pull the R.O.B.s away from the bombs, Captain Falcon calls in the Falcon Flyer, DK grabs the melancholic R.O.B. and the Smashers depart, despite Meta Ridley getting in their way. Captain Falcon drives the Falcon Flyer straight into the Subspace along with everyone else. Unfortunately, Tabuu uses his Off Waves to reduce them all into trophies; R.O.B. among them. King Dedede, Ness, Luigi and Kirby, who were revived by the Dedede Brooch, find them and bring them back to life. With all heroes reunited, they endure the Great Maze and fight Tabuu. R.O.B. is one of the few characters who has two names displayed throughout the story. The first time is as the Ancient Minister and the second time as R.O.B. Zelda and Samus also have different names displayed, labelled at different times as "Sheik" and "Zero Suit Samus", respectively. R.O.B appeared several times in the Subspace Emissary as the Ancient Minister until he was finally revealed to be a friendly R.O.B unit. He appeared in Midair Stadium, The Plain, The Battlefield Fortress (where he was seen being attacked by Ike to prevent him from dropping a Subspace Bomb), The Cave, The Wilds (Part II), & finally in The Subspace Bomb Factory (Part I). Event 24: Come On! Blue Falcon! : Captain Falcon must use his Final Smash, Blue Falcon, to defeat two R.O.B.s on Port Town Aero Dive before one full lap is complete. Event 27: Three-Beast Carnage: A tiny R.O.B must defeat a giant Bowser, a giant Donkey Kong, and a giant Charizard on New Pork City. Event 39: All-Star Battle x2: R.O.B. is one of the eight opponents fought in this event along with King Dedede, Ike, Lucario, Toon Link, Snake, Sonic, and Wolf. Co-Op Event 10: The R.O.B. 's of Tomorrow: Lucario and the Ice Climbers must defeat five R.O.B.s of varying sizes on Summit. Co-Op Event 18: The New Weapon of Shadow Moses: Snake and R.O.B. must defeat two other R.O.B.s on Shadow Moses Island. Co-Op Event 21: The True All-Star Battle: Both players select a character and take on the entire roster on Battlefield. R.O.B. 's main and Final Smash trophies can be obtained by clearing Classic Mode and All-Star mode respectively with R.O.B..
R.O.B. sporting his Famicom colors. R.O.B. debuted in Japan as Robot in 1985 as an add-on for the Famicom. He could be combined with a "gyro set," etc. for two types of play. The player controlled Professor Hector, the TV emitted light, and R.O.B. responded to the light by moving. At the time, it was epoch-making game play. Recently, R.O.B. appeared in Mario Kart DS. R.O.B. 's Final Smash. He emits a beam from his eyes that spreads across the spectrum and undulates in great variety as it travels. What makes this technique different is R.O.B. 's ability to move while using it. This allows him to use it in combination with his other moves to increase his Final Smash's effectiveness. The entirety of R.O.B. 's "voice" is composed of NES-style noises, although this is difficult to discern during a fight. R.O.B., Mr. Game & Watch, Olimar, and Samus are the only characters that do not have voices. R.O.B. is the only character in Super Smash Bros. Brawl without a stage representing his universe. Instead, Mario Bros. is used as his home stage. Delfino Plaza is used if Mario Bros. has not been unlocked yet. In addition, R.O.B. and Ganondorf are the only characters that are unlocked on a stage that does not hail from their respective universe. R.O.B. is the only character in Brawl who can hold 4 consecutive charges at the same time; a smash attack, a fully charged Gyro, Robo Beam and the automatic replenishing of his fuel capacity for Robo Burner. While some characters cannot be put in helpless naturally, their helpless state can be seen via hacking. R.O.B. is the exception, as the game freezes if he is put in helpless state, meaning he was not programmed to have one. R.O.B. is the only character to spin horizontally when using a Screw Attack. Despite this, the graphical effect continues to spin vertically. On the base of R.O.B. it reads "FAMILY COMPUTER ROBOT". However, when using the gray palette swap, it reads "R.O.B. 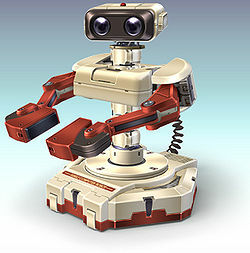 Robotic Operating Buddy", a reference to the English-language version of R.O.B. Brawl is the only game where R.O.B. 's Famicom coloring is his default coloring in all regions. When spawning items on training mode with R.O.B., the items will spawn much farther than with other characters. This makes it specially difficult to spawn multiple Smart Bombs continuously in order to rack up the combo meter. Smash Bros. DOJO!! Page on R.O.B. This page was last edited on November 10, 2018, at 14:08.